What are the goals for information and communication technology use in early childhood education? On a typical day, children ages 3–5 spend an average of four hours with technology, and technology use is increasing among children of all ages. Although young children are using technology often, and in spite of growing evidence that technology use can benefit young children, technology use in ECE remains a topic of considerable debate. To ensure that technology is integrated intentionally and productively into ECE settings, stakeholders need a common set of goals for technology use among young children. Using findings from a literature review and the perspectives of participants in a May 2014 forum, we identified four goals that could anchor future conversations about technology use in early childhood education (ECE). Technology as One of Many Tools: When technology is used as one tool in a larger toolbox, it can provide the greatest benefits while continuing to allow for the use of other learning tools and activities when they are likely to be most effective in supporting skill growth. 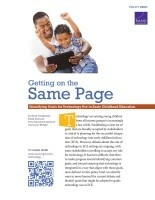 Support School Readiness in Digital Literacy: With increasingly higher standards for technology use in early elementary grades, forum experts agreed that all children, particularly low-income children, could benefit from acquiring basic technology literacy skills in ECE settings to ensure readiness for technology use in the classroom. Help Narrow the Digital Divide: Technology use in ECE settings has the potential to address both aspects of the digital divide: access and use. In ECE settings, children from low-income families can access technology that is not available in the home, and they can be taught to use technology in ways that are more likely to result in skill growth and learning, thereby addressing disparities in use. Expand Resources for Providers and Families: Goals for technology use in ECE settings need not focus exclusively on use among children, as there are many ways that technology can be used to support providers and families as they, in turn, support the education of young children. Daugherty, Lindsay, Rafiq Dossani, Erin-Elizabeth Johnson, and Cameron Wright, Getting on the Same Page: Identifying Goals for Technology Use in Early Childhood Education. Santa Monica, CA: RAND Corporation, 2014. https://www.rand.org/pubs/research_reports/RR673z1.html.